Becoming a mom is no cakewalk, acidity and low immunity can make it even more difficult. 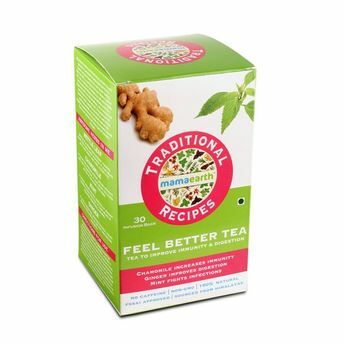 Grab a cup of Mamaearth Feel Better Tea which is a 100% natural herb based tea, safe for both mamas and mamas-to-be. It will protect you from all the infections while strengthening your immune system. It also aids in digestion and revives you for the day. A handcrafted blend of Nettle leaf, Ginger, Mint and other soothing herbs, this tea will calm those unwanted stomach issues while making you strong inside. Take a sip and get set for a day of smooth sailing.